The Caribou Inn & Convention Center features 72 spacious, newly furnished guest rooms. The Caribou Inn & Convention Center offers customers everything they need to put together the perfect function. The fitness center provides opportunities for both members and guests to accomplish their health goals. The Caribou Inn & Convention Center, Aroostook County's finest full-service hotel & conference facility, is conveniently located just three miles south of the city of Caribou, "The Hub of the County." Caribou, known for its picturesque rolling hills and scenic farm lands, is centrally located near many of the County's beautiful lakes, rivers, and streams. Being in the "Hub of the County" makes the Caribou Inn the perfect destination for vacationers and business travelers alike. We are located just 9.2 miles from Presque Isle, Maine (Aroostook County's largest city), home to Northern Maine Regional Airport, Aroostook Centre Mall, University of Maine at Presque Isle, The Aroostook Medical Center, and just 10.8 miles from the Loring Commerce Centre, DFAS, and Maine Military Authority. In addition, Fort Kent and Madawaska are just an hour's travel away. This makes the Caribou Inn & Convention Center not only your hotel of choice, but also for convenience. Nestled between the Aroostook River, scenic potato fields, and an abundance of wildlife, we offer the perfect setting for a peaceful & relaxing stay The ITS trail system, providing perfectly-groomed winter trails, comes right to our back yard, making the Caribou Inn & Convention Center convenient for snowmobiling enthusiasts as well. The Caribou Inn & Convention Center offers 72 newly remodeled, comfortable guest rooms & executive suites. We offer all the modern conveniences, with complimentary high-speed wireless internet access throughout our facility, an indoor heated pool and hot tub, restaurant, bar, and extensive conference and meeting facilities. Our Conference Center can accommodate everything from intimate gatherings, interactive business meetings to large-scale exhibitions & catered events. The Caribou Inn & Convention Center is home to The Greenhouse Restaurant, the finest dining experience in Northern Maine. In addition, Albie's Lounge is a comfortable cocktail bar offering a quiet place to relax, socialize and unwind. Guests looking to maintain their exercise routine will appreciate our 8,000+ square-foot on-site fitness facility, the Caribou Health & Wellness Center. 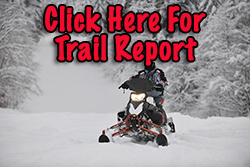 Check out the most for the latest trail conditions!